Maize (Zea mays L. cv. Contessa) was grown with a nitrogen supply that was just sufficient to support maximal biomass production. The third leaves from 14-to 21-d-old plants were harvested and net photosynthesis allowed to attain steady-state rates at an irradiance of either 250 or 700 μmol·m−2·s−1. Nitrogen in the form of either KNO3, KNO2 or NH4Cl was then supplied to the leaves through the transpiration stream. In all cases the addition of the nitrogen source resulted in an approximate doubling of the total amino-acid content of the leaves within 1 h. The glutamine pool increased to ten times the level found in control leaves in the light in the absence of added nitrogen. Glutamine accounted for about 21–24% of the total amino-acid content in leaves fed with 40 mM NH4Cl. Nitrate caused a rapid, but transient inhibition of the rate of net CO2 assimilation, accompanied by an increase in the activity of phosphoenolpyruvate carboxylase and a decrease in the maximum extractable activity of sucrose-phosphate synthase. This demonstrates that the activities of phospho-enolpyruvate carboxylase and sucrose-phosphate synthase are modulated by NO 3 − in the C4 plant maize, in a similar manner to that observed in C3 plants. Nitrite or ammonium feeding resulted in decreased rates of CO2 assimilation for as long as the nitrogen source was supplied. In all cases the degree of inhibition was greatest at high irradiance and least at low irradiance, even though the total amino-acid contents of the leaves were comparable at the time when maximum inhibition of CO2 assimilation occurred. Measurements of chlorophyll-a fluorescence showed that the quantum efficiency of PSII decreased and non-radiative dissipation of excitation energy increased as CO2 assimilation was inhibited by nitrate or nitrite. These metabolites had no direct effect on thylakoid PSII-based electron transport. Ammonium ions weakly inhibited O2 evolution at high concentrations. 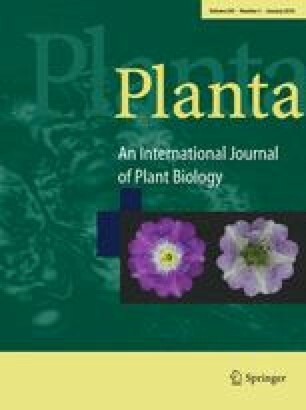 The addition of nitrogen (KNO 3 − , KNO2 or NH4Cl) caused a significant decrease in the phosphorylation state of the light-harvesting chlorophyll-a/b-binding protein of the thylakoid membranes. We conclude that the response of photosynthetic carbon assimilation and electron transport in maize is essentially similar whether nitrogen is supplied in the form of nitrate, nitrite or ammonium, with the noteworthy exception that the nitrogen-induced inhibition of photosynthesis is transient when leaves are supplied with NO 3 − but sustained when NO 2 − or NH 4 + is provided. We suggest that the observed modulation of phosphoenolpyruvate carboxylase and sucrose-phosphate synthase is mediated by the increase in the endogenous level of glutamine. Furthermore, the transient nature of the inhibition of CO2 assimilation in the case of NO 3 − , but not NO 2 − or NH 4 + , may be due to regulation of nitrate reductase. We wish to thank Gabriel Cornic (Structure et métabolisme des plantes, Université de Paris-Sud, Orsay, France) for useful discussion. We are grateful to Sylvie Ferrario (Laboratoire du Métabolisme, I.N.R.A., Versailles) for optimising the conditions of assay and extraction of SPS and PEPCase from maize leaves.